On a holiday with her mother and brother in Key West, young writer Martha Gellhorn has a chance encounter with Ernest Hemingway at a conch bar. They strike a conversation, and Martha and family are invited to the Hemingways’ property for an afternoon. It turns out that the Hemingways are fans of Gellhorn’s short story collection. A friendship is born out of mutual admiration and respect, and that eventually transitions to a full-blown romance while both are covering the happenings of the Spanish Civil War as war correspondents. After the fall of Spain to Generalisimo Franco’s forces, Gellhorn and Hemingway meet in Havana. Hemingway is at an impasse with his current wife. Eventually, the divorce from his second wife comes through. By then, Gellhorn and Hemingway have been living under one roof for quite a while on a property in the periphery of Havana. During the seven years of their marriage, their love goes through lots of ups and downs. They are frequently away, sometimes together, most times on their own. He, on holidays after finishing For Whom the Bells Toll, or playing spy, patrolling the Caribbean searching for U-boats; she, covering the invasion of Czechoslovakia, the Winter War between Russia and Finland, the impending closure of the Burma Road during the conflict between China and Japan, and ultimately World War II, where she had the (serendipitous) distinction of being the only journalist (male or female) to witness D-day right at the battle front. After reading Circling the Sun, a novel about the trailblazer horse trainer and aviator Beryl Markham, I was captivated. Not only I wanted to know more about Markham, but in me McLain gained a fan. I requested this ARC early when I saw this book listed by several reputed publications as one of the hottest releases this year. I have to say I am disappointed. In Circling the Sun, McLain made 1930s Kenya, its expatriates community, and Beryl Markham, come alive. She was a firecracker, inspiring, a pioneer. Martha Gellhorn was certainly all those things yet McLain could not paint her alike. Perhaps even though McLain is a fan, she didn’t fully understand Gellhorn’s motivations, her inner world. In McLain’s portrayal, Martha Gellhorn, who narrated the story in first person—third person accounts, meant to capture Hemingway’s state of mind, also pepper the novel— came across as an insecure woman who didn’t feel whole alone, and who was afraid of the large shadow cast by Ernest Hemingway. I get that it must have been hard not to feel a little intimidated by a writer of that stature and larger-than-life personality, but it felt like she was jealous of his fame and couldn’t handle the comparisons. I also get that it must have been hard to see her work belittled by those comparisons and her personal appearance, as if she lacked talent and had gained a readership solely because of her association with Hemingway, but if her ego couldn’t handle the bruising why risk a relationship? Did they love each other? Maybe, but not even that sounds authentic in this novel. The writing feels flat, stilted; it is not that it lacks literary images, it is that they are not vivid enough. To be fair, I have to admit that there were two moments when Paula McLain made me feel the magic of her earlier novel: first, when Gellhorn and Hemingway met; Hemingway came alive in full glory seen through the eyes of an infatuated young woman with a famed author. Alas it did not last. Second, there were sparks when Gellhorn met Hemingway’s kids for the first time. They came alive as well, but that magic did not last either. The war images, particularly on D-day, were disturbing but unfortunately did not contribute to form a whole picture of what she saw and how it affected her. 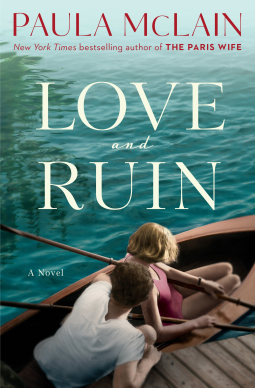 I have seen Love and Ruin being given almost five stars ratings on numerous reviews. It is possible that the novel didn’t specifically work for me as did for other people. I’ll be reading The Paris Wife because people have raved about that novel, but after that one I have to consider if I want to give Paula McLain another chance. Disclaimer: I received from the publisher a free e-galley of this book via Netgalley in exchange for my honest review. I have read The Paris Wife. I did not like it a bit. (http://keepthewisdom.blogspot.com/2012/03/paris-wife.html.) So I chose not to read this one though I did have the idea that Gelhorn was a stronger woman than the first wife. Now due to your review, I wonder. Because of my disappointment in The Paris Wife, I also passed on Circling the Sun. I loved Beryl Markham's own memoir West With the Night (http://keepthewisdom.blogspot.com/2012/06/west-with-night.html) and could not bear to have that spoiled in any way. BUT, I am thrilled to see a book review from you!!! You gave the book a careful analysis and confirmed my decision to skip the book. Oh oh, you saying that you didn't like The Paris Wife doesn't give me confidence. I've begun to wonder if she is one of those hit and miss authors. I'll give the first novel a try, but I'll proceed with caution. I thought that Circling the Sun was stellar. She would have made Markham proud. What an insightful review. It's always disappointing to read a work by a writer that we have admired that doesn't live up to the standard we expect of them, but it happens. Writers are human, too, I guess! Thank you, Dorothy. Yes, it's disappointing to read mediocre stuff but our favorite authors, but luckily for us readers, some writers evolve from the criticism. I hope I wasn't that harsh on McLain. It wasn't a bad novel; maybe just not for me. I'm sorry this was disappointing. I haven't read any of Paula McLain's books, although I've been tempted by them. Maybe I'll try Circling the Sun as you enjoyed that one so much. I hope that if you read it, you enjoy it as much as I did. I definitely recommend it. Kenya, the 1930s British expatriate community, and Beryl Markham came alive in full glory. This one though, left too much to be desired. Like you I enjoyed Circling the Sun and have read all of Markham's books too. I have started Love & Ruin & will finish it, but I sense I'll probably have a similar reaction to it as you did. I do have a biography of Gellhorn which I hope to read sometime. Was she totally insecure in life or a real heroine? -- this is what I hope to find out. For female journalists, she was on the front lines before anyone else ... so that says something; I don't know her like I do Markham. You have written a fine review and it does seem a bit disappointing. Still I haven't given up on McLain. Thanks, Susan. Circling the Sun was very vivid, that's probably why this one seems so lackluster. McLain has Author's Notes at the end, and it seems that the rivalry between Hemingway and Gellhorn was real. She also stated that Gellhorn travelled the world extensively and covered, way into her late years, most of the conflagrations of the 20th century. Additionally, she published short story collections, novellas and (five?) novels. She was a trailblazer. Alas, that didn't come across through McLain's pen.